Our Introduction to Coconut Water. If you're new to it, read this to get started! We talk about the benefits, nutrition, how to use it, and where to get it! While new to America, coconut water's benefits are no surprise to those who have been drinking it for centuries. 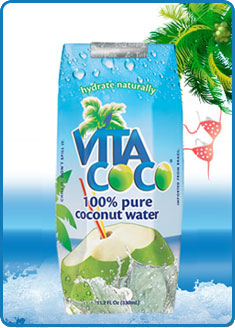 Vita Coco is our featured drink on this site! It has a great combination of flavor, value, and is completely natural, unlike some other products that come from concentrate. Read all about Vita Coco's nutrition facts, flavors, and see why we like Vita Coco so much here! We've got you covered with the best deals anywhere - we use price comparison technology to send you to the best store for each product. So get the best price on the best products with free shipping and start hydrating today! Zico is the most popular brand of coconut water and it comes in many flavors - now including chocolate! We stay away from the processed, concentrate-based products, but there are still some quality products in their lineup. Everything you need to know about Zico is here! O.N.E. Coconut water is a breath of fresh air compared to other soft drinks out there. This is another "never from concentrate" product that is quite underrated. Coconut Water: Why is it a Good Post-Workout Choice? Nature Factor Coconut Water is the ONLY 100% Purely organic coconut water that you can easily and cheaply find on the net. Nature Factor is very delicious! Taste Nirvana isn't any ordinary drink - this is THAI coconut water. What's that mean? In case you've never been to Thailand and had their amazing coconuts, it means that Taste Nirvana is SWEETER and more DELICIOUS! You read right - chocolate coconut water is here! This is a long-awaited treat for anyone who likes to junk on drinks like Yoo-Hoo or NesQuik, or wanted a new type of kick to their drink rotation. Saturated Fat – Is it Really Bad For You or Have We Been Fooled? Saturated fat has been the arch-nemesis in numerous "saturated fat vs unsaturated fat" studies. But what is the real truth? Is saturated fat bad for you? Sports Drinks? Drink Coconut Water Instead! Sports drinks have had their day in the sun, but now it's time for something new -- something natural -- coconut water. No more high fructose corn syrup! Coconut Cream is like Coconut Milk but has much less water, so it's thicker and is used for different reasons. See a great coconut cream pie recipe here! Coconut milk is a white milk-like substance obtained from a mature coconut. There are many uses for coconut milk with recipes and nutritional benefits too! Coconut Meat is a great addition to a healthy diet. It is a great source of dietary fiber, which helps regulate digestion, and there are healthy fats too. Aloe Vera Juice – Good, But as Good as Coconut Water? Aloe Vera Juice benefits are many and one must give it credit because of its medicinal values. But we must say... it's just not as good! Electrolytes – What do they Do and How Do I Get Them? Electrolytes have a myriad of health benefits for the body - their balancing effects in your body are crucial. We're loaded with electrolytes around here! The clear liquid found inside the young fruits of the coconut palm is called coconut water. The young coconut fruit contains a small amount of white meat, and when these fruits mature, the water from this coconut is replaced by more coconut meat. This delicious, energetic water has long been enjoyed by many people; not only for its taste, but also for the many health benefits that it provides. This soothing drink is very popular in tropical places such as Southeast Asia, Hawaii, the Caribbean Islands as well as in Africa. It is usually served fresh in these places, but it can also be purchased in bottles or cans. You can get it cheapest online using our price comparisons which are scattered all over this site. All parts of the coconut tree such as the leaves, the husks, and the coconut fruits can be used in many different ways. This is the main reason why the Coconut tree has been named as the “Tree of Life.” Starting from the roots all the way to its tips, the different coconut tree parts can be used for several purposes, ranging from culinary uses to non culinary uses. However, a lot of people consider the young water itself to be the most useful of all parts of this tree. There are so many benefits that you can get from drinking coconut water, the most important of which is the health benefits that it provides to its drinkers. 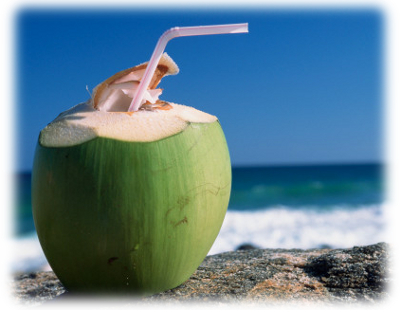 Drinking the liquid of the young coconut helps the body maintain its regular temperature. Apart from containing low percentage of carbohydrates, this soothing drink is also 99% free from fat. The naturally occurring sugar content is extremely low. It contains components which promote a healthy growth that are all natural compounds. It is a known treatment for malnourishment. It treats intestinal problems and disturbances occurring in infants. This is an isotonic beverage that contains natural components. Its electrolyte balance level is the same with that of the blood. It contains high amounts of electrolytes that the body needs to keep hydrated. Since it has high electrolyte content, it is known as an effective treatment for urethral stones and other kidney problems. You can drink as much as you want and be able to rehydrate naturally since it is free of chemicals and processed sugars. It has also been proven that this liquid refreshment also helps lower arterial pressure, relieve stomach pains, discomforts as well as spasms. Alcoholic drinkers can take it in place of sports beverages that contain high levels of sugar and carbohydrates to help prevent hangovers. This is a beverage that people of all ages can enjoy. Since it's been proven to be very healthy and beneficial, a lot of companies have started their own business that provides this refreshing and soothing beverage. However, some of these drinks have been processed through a method which caused some of its natural components to be eliminated. If you want to get the best out of your money and be healthy, you should consider buying these products: Vita Coco Coconut Water, O.N.E Coconut Water, Grace Coconut Water, VPX Sports Coco Fit, Taste Nirvana, and Zico Coconut Water. Vita Coco is a product which is imported straight from Brazil. It makes use of 100% all natural coconut water. This brand of coconut beverage contains electrolyte levels which is more than 15 times the electrolyte content found in most sports drinks other beverages claiming to help its drinkers be "rehydrated." O.N.E. is manufactured by One World Enterprises. The isotonic beverage has been made into a more satisfying and refreshing drink by introducing other tropical flavors such as Pink Guava, Pineapple, and Mango. This drink contains more than eighty five percent by volume coco water. The manufacturers ensure the drink’s freshness by packaging it right at the source. Grace products are manufactured by Grace Foods, which is a company that had started distributing quality Caribbean products since the year of 1922. VPX Sports Coco Fit is a health drink that does not only contain the healthy liquid from the coconut itself, but it also Omega-3 fats, vitamin D, and natural anti-oxidant ingredients. This coconut drink ensures that you do not only get the most out of it after your workouts (this is where VPX accels - they are a high-quality supplement manufacturer that normally cater to the bodybuilding community). You also have the added benefits of other vitamins and minerals. Taste Nirvana Coconut Water comes with real coconut pulp. Manufacturers of this beverage ensure that they only make use of all natural ingredients that do not contain any amounts of caffeine and gluten. Zico Pure Premium Coconut Water is the newest development when it comes to coconut drinks. Zico combines all the benefits that come from the coco water with its all natural dark chocolate flavoring. This product is also dairy-free, so for those who want to drink chocolate-flavored drinks that are lactose-free, you should consider this brand. 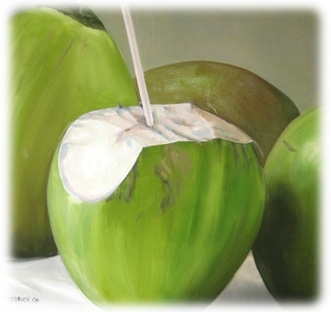 If you live in Southeast Asia, in the Caribbean Islands, in Latin America or any of the Tropical countries, then you would not have to look far and wide just to be able to drink coconut water. If you live in North America, you would be facing some kind of a challenge with your search. However, the good news is that you do not have to travel across the world just for you to have this beverage. Through the advancement in technology that science gave birth to, you can now use the World Wide Web to order cans and cans or bottles and bottles of this refreshing liquid at very affordable prices. 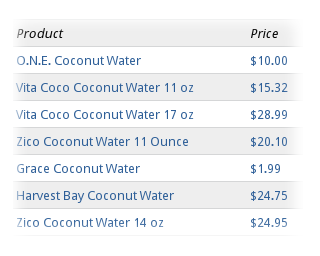 If you are worrying about buying coconut water beverages online, you do not have to. These healthy drinks come in sterile packaging that ensures the liquid refreshment will stay fresh. The containers that these trusted manufacturers make use of are aseptic packaging. The container is sealed right after it is filled with the beverage to make sure that no bacteria or other components will get inside the packaging. Apart from this, you can also rest assured that these beverages have long lives, which means that the product will take a long time before it expires.